Beads Grand Prix 2008 / Fine Work in Glass Beads Div. 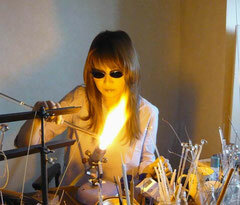 The concept of my work is “loveliness and delicacy”. I like it best when the colored glass is sparkling through clear glass. wrap them with clear glass, and make them into glass beads. the coloring most suitable to my work while showing the colored glass inside the best. with glass which is actually a hard material. as well as simple pattern are finished elaborately especially with extra care. (C) 2012 plumerias All Rights Reserved.